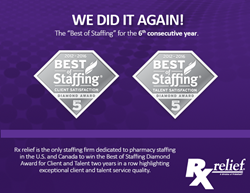 Rx relief, part of the PrideStaff group of companies, announced they were named one of Inavero's 2016 Best of Staffing® Client and Talent Diamond Award Winners, after winning the Best of Staffing Client and Talent Awards at least five years in a row for providing superior service to their clients and job seekers. Earning the Diamond Award distinction demonstrates our ability to help clients secure the talent they need, while providing candidates and employees with outstanding industry opportunities. A division of PrideStaff, Rx relief is a Joint Commission Certified and GSA approved pharmacy placement firm providing temporary and full-time pharmacy professionals for all pharmacy practice settings. The parent company was founded in the 1970s as 100 percent company-owned units and began staffing franchising in 1995. They operate over 74 offices in North America to serve over 5,000 clients. With over 40 years in the staffing business, headquartered in Fresno, CA, all PrideStaff brands offer the resources and expertise of a national firm with the spirit, dedication and personal service of smaller, entrepreneurial firms. For more information on PrideStaff, Rx relief services or for franchise information, visit http://www.pridestaff.com or http://www.rxrelief.com.